It’s no secret: Target is one of our favorite places to shop. Somehow, we always end up buying more than what we went in for, but we’re okay with that. It’s part of Target’s charm. The ubiquitous retailer recently dropped their Black Friday preview deals and we are once again overcome with love and adoration for our favorite bullseye. But Target is always one to go above and beyond, and this Black Friday is no different. This year, Target REDcard holders get early access to the best deals. The early access period begins on Nov. 22nd and continues until Nov. 25th. The online deals are going to be way too amazing to pass up, and REDcard holders will sweeten the deals with an additional 5% off purchases! There are FORTY pages worth of deals, so go ahead: run wild with it! This holiday season boasts the greatest number of Black Friday deals that Target has ever made available before Thanksgiving. Target: a shaker of tables and an innovator. REDcard holders are eligible for free shipping on most items, and get 30 extra days to return unwanted items. While restrictions do apply to these perks, membership definitely has its privileges! Privilege number one? 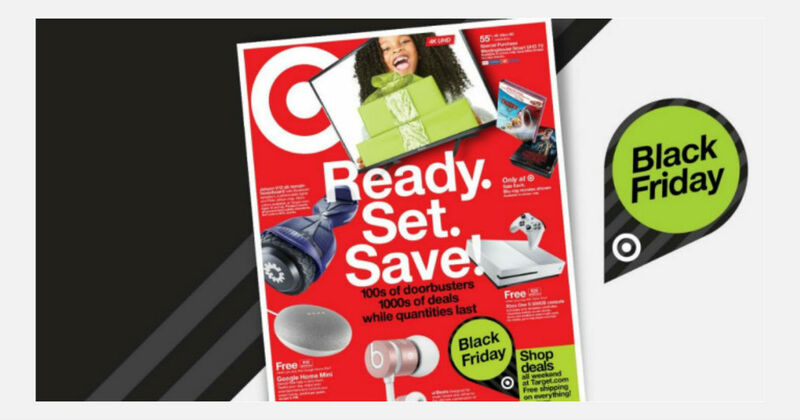 Using your Target REDcard to shop those Black Friday deals a week early. Feeling nervous about opening another credit card account? Don’t sweat it! Target’s REDcard is FREE and available as a debit card and a credit card, so everyone has a chance to get in on the sweet savings. You can sign up for yours right here! If you’re already a member, be sure to use your REDcard to take advantage of the amazing Black Friday previews and let us know what your favorite deals were!